I often get asked what I feel is the best exercise for the upper body. Of course, there isn’t one. But when it comes to building size, strength and mobility in the upper body nothing surpasses the muscle-up. Since it combines a pull-up and dip into one movement it stands alone as being a single, unstable strength exercise that challenges the upper body pulling and pushing muscles through a full range of motion. The muscle-up is one of those strength exercises that’s tougher than it looks. Before I attempted my first rep last spring I could easily do 25 pull-ups and dips from the rings. So when my gymnastics coach showed me the technique, I thought: Heck, I just need to pull really hard in the pull-up portion, flip my hands, and my body will continue into the dip. Yep, I failed miserably the first time I tried a muscle-up. And most of my athletes do too, even though most of them are already pretty strong and fit when they hire me. This exercise requires a lot of technique – you can’t fight your way through it, regardless of how strong you are. If you haven’t been training the pull-up or dip on rings, it’s time to start. Your shoulders, chest, and upper back must first get accustomed to the instability of the rings. Second – and this is crucial – you must work up to a full range of motion pull-up and dip. The dip is especially important here. When you transition from a pull-up to the dip in the muscle-up your hands will be very close to your armpits. So you must have strength in that position to pull off the movement. This strength comes from building your strength and mobility so you can perform the full range of motion lowering phase of a dip where your thumbs touch the outside of your pecs. Be sure to stretch your shoulders, pecs and lats, too. The most difficult part of learning the muscle-up for me, and virtually everyone I talk to, was getting accustomed to doing pull-ups with a false grip. The false grip (aka, deep grip) is the wrist position that allows you to flip your hands into the correct position during the transition phase between the pull-up and dip. 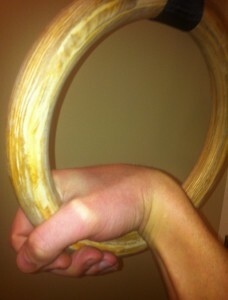 If you grip the rings normally and attempt a muscle-up you’ll never make it. Your wrists must be the same height as the rings, hence the necessity of the false grip. I’ll tell you upfront that doing pull-ups with a false grip is very humbling. You’ll swear your arms will never fully straighten at first when you attempt to hang in the bottom position. But like any difficult movement, be patient and your strength will increase rapidly. Once you get the point where you can do 5 full range of motion dips on the rings and 5 full range of motion pull-ups with a false grip, you’re ready to start experimenting with the muscle-up. Check out the video below so you can start studying the muscle-up. This post just briefly covers a few of the key points. Importantly, nothing beats hands-on instruction and coaching. Especially for complex exercises like the muscle-up. That’s why I’ll be covering it in my next seminar. The muscle-up is one of 5 essential rings exercises I’ll teach in my upcoming Phoenix seminar on February 2-4. To find out how to attend this awesome coaching event click the Phoenix Seminar Details here. Chad, by ‘full-range pullup’ do you mean chest to bar ? If so, what if one cannot get his chest to the bar ? Negatives at that point ? Thanks! CW: No bar. As I said in the post you must practice pull-ups from rings to do a muscle up. Focus on doing partial reps at the very top of the movement if you’re weak. Make an effort to pull your chest all the way up to the rings. I just ordered rings….this should be interesting. Pull ups on a fixed bar have been aggravating my wrists anyway- hope this alleviates that. In a few weeks I’m going to give your HFT for arms program a go using the Waterbury Diet for muscle growth. I’ve been using either 6 or 7 pm to start my eating period. Sometimes I work afternoon shifts so I was wondering if it’s ok to do the full body session in the morning, start eating at work around 7 then when I get finished around 11 or 1130 do the arm session and finish with a post workout shake and then start fasting again? CW: Yes, that will work. Be sure to have a scoop of whey protein after your morning workout. Chad, I know this doesn’t really relate to this article, but I was wondering. Would it be possible to achieve hypertrophy in my legs using the following two methods combined. The exercise would be an overcoming isometric, like a trap-bar squat set-up, but of course it wouldn’t move. I would change the height each set too. CW: Up to 10 sets of 10s max holds is too draining to do 5-6x/week. Do 3-4x/week instead. Three weeks strong of 6 days a week pull-ups on rings. Shoulders have never felt better. Any equipment recommendations for 6 days a week push-ups to limit shoulder pain? Thank you for all your help. CW: Yes, position the rings low and do push-ups from them. Go for a full range of motion. How often can one perform bodyweight exercises, whether on rings or otherwise? For instance, I want to start doing ring dips and single-leg squats/pistols. I’m currently hopeless at each and was wondering if daily workouts of a few sets is overkill, or should I space these sessions over a weekly period? CW: Start with every other day for 2 weeks and see how your recovery goes. From there, add one extra session every few weeks if your body can handle it. My gym hasnt gotten around to buying a set of rings, and I have seen some “Champions of YouTube” doing muscle-ups on pullup bars instead of rings. However, I know that just because some skinny dude is doing it on YouTube doesn’t mean it’s the right thing to do. So, I ask you — muscle-ups on a pullup bar: worthwhile pursuit or ineffective waste of time and effort? CW: It’s an ok exercise, but I don’t use it because it can be tough on your elbows/shoulders. Use rings instead. Chad, Thank you for this article and all else that you do to share knowledge. I hope you have had a great Christmas and enjoy the New Year. CW: The squat form I prefer to use with clients is outlined in my book, Huge in a Hurry. Thanks for the recommendation, Chad. I just emailed the university bookstore I usually buy books from. Do you have a lot of readers from Europe, and Germany specifically? CW: Yes, I have a big market in Europe and Germany. In fact, Huge in a Hurry has a German version for that reason. I’m really liking the shift you’re making towards more bodyweight movements. This is something I’ve been incorporating into my own training for the past year as well. It all started when I was doing anti-piracy missions and stuck on a ship for a few weeks with no gym. I would bring rings with me and wear my body armour for added weight. I usually cycled a few weeks of BW workouts on a ship, with a few weeks of heavy weight training back home, and found that they compliment each other quite well. I’m now working in Iraq and have access to a small gym, as well as my rings that I never leave home without. My question is this, I usually train 3-4 days per week (full body mostly, sometimes upper/lower) with weights and want to keep working at the rings as well, what would you recommend for my ring training… Should I be doing it on my off days, on workout days, or perhaps every other off day? I would like to be able to work on the rings at least 3 days a week, as well as weight train 3 days a week at minimum. CW: If you have the time, do rings earlier in the day and lift weights later in the day, three days per week. Or do rings work at the beginning of your workouts.